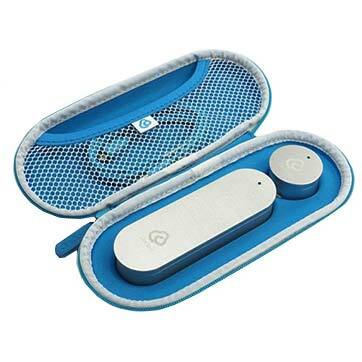 CliniCloud is a portable Medical Kit that includes a compact digital stethoscope and non-contact thermometer. Both medical tools work with a phone app to provide metrics and analysis on information such as temperature, heart rate and respiratory readings. A non-contact thermometer takes instant temperature readings, while the digital stethoscope allows you to diagnose common conditions. By combining next generation infrared technology with Bluetooth connectivity, the CliniCloud thermometer takes temperature readings quickly and effortlessly - no skin contact required. Intuitive app guides you through quick or full checkups, and also provides respiratory rate and heart rate metrics. App is compatible with devices running iOS 8 and above, or Android 4.3 and above. Store health readings on your Smartphone or on a secure cloud server. Designed to monitor fever, chill, cough, wheeze or cold. Digital stethoscope lets you easily diagnose common conditions like the cold.